Exo Terra UVB 150 Tube 36in x 1in 30W | Livefood UK Ltd. 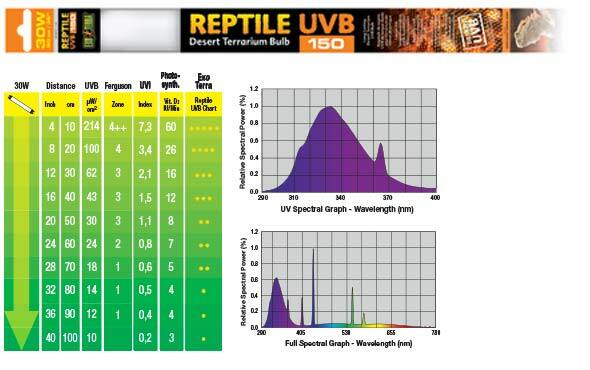 The Exo Terra Reptile UVB150 has a very high UVB output similar to sunlight in deserts. These locations receive more direct sunlight, therefore desert reptiles are more exposed to UV radiation than any other type of reptile. This bulb can also be used on terrariums with denser screen covers to ensure sufficient UVB penetration. Dense screens can filter out up to 50% of the UVB rays. The high Vitamin D3 yield index ensures vitamin D3 photosynthesis to aid calcium absorption and prevent metabolic diseases.